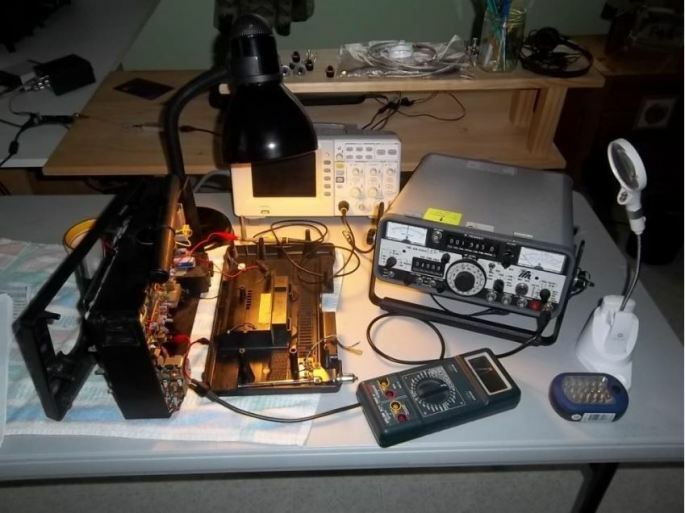 A few years back when I was hunting for a used RF-2200, a second-hand National Panasonic DR22 was for auction on eBay. 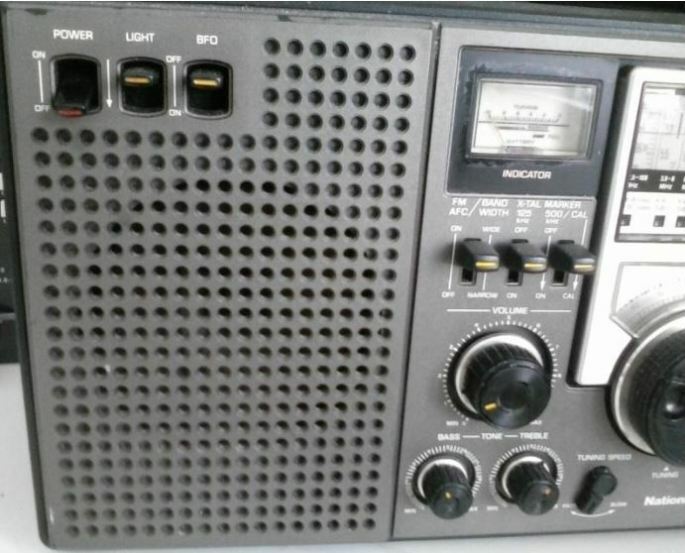 These radios were sold in Europe and are almost an exact match for the RF-2200, with a few minor cosmetic differences. It was so close in appearance that I decided to bid and won the auction. The cost was around $150.00 plus shipping. The seller described the unit as working, not a tech special, and was complete except for the original earphone. The strap, which can be missing on some used models was in place, the antenna and all the knobs were there. When the radio was received, all appeared to be working well and most importantly the rotatable ferrite antenna was fully functional. 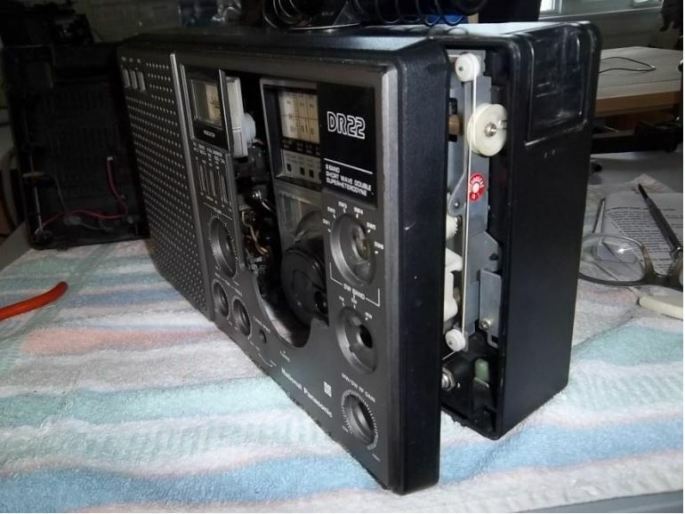 With the exception of tiny paint specks and years of accumulated dust the unit was cosmetically acceptable for a 40 plus year old radio. After a close olfactory inspection (smelling the unit hi hi) it was determined the radio was from a smoke-free home, which is important as smoke not only causes yellowing of plastic components, but it inundates the internal electronic components and coats them with a yellowish-brown stain. 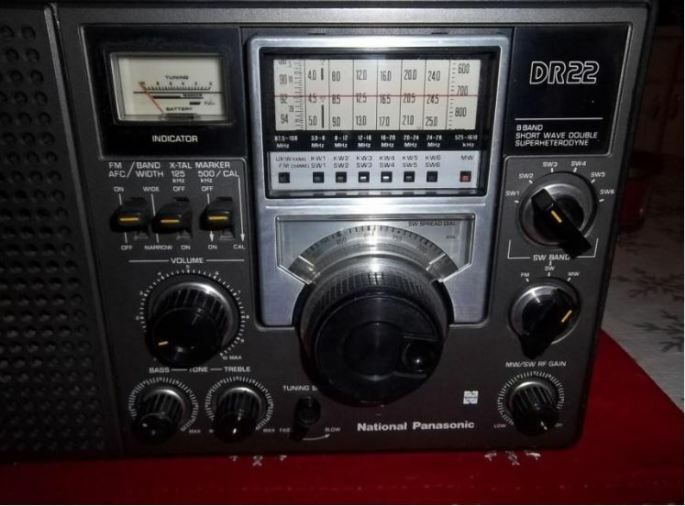 On close inspection, the unit differs slightly from the RF-2200, in that it is branded as a “National Panasonic” along with the “DR22” designation on the upper right of the unit. And, the National Panasonic logo can be seen to the left of the AM/SW gain control. Another difference is the additional labeling found above each shortwave band, the designations are KW1, KW2, etc. 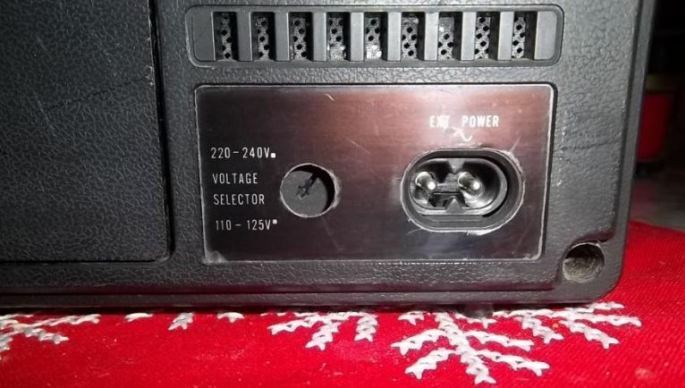 As for the rear panel of the DR22, a major difference is the presence of a voltage selector which allows one to switch from European voltage (220) to the US standard (110). Inside the unit there’s a transformer that handles this option. Alternatively you can simply use four “D” batteries to power the unit. After receiving the unit, first order of business was a good cleaning of the outer case with mild soap and water. All the knobs and carrying strap were removed and soaked in a warm soapy solution. A toothbrush was put to work to remove years of human tactile residue from the sides of the knobs. Knobs (left) removed for cleaning. Carrying strap (right) was inundated with decades of dirt. Next on the “to do” list was to obtain a copy of the service manual, available on line. You’ll find it under the title of National Panasonic RF-2200BA. It’s an excellent manual with detailed photos of the circuit boards, exploded diagrams of the mechanical parts, parts list, schematics, and of course the alignment procedure. Cracking open the case required removal of all the case screws and very gently coaxing of the two panels apart. Years of use, rust on the screws, and dirt/dust buildup all contribute to the challenge of this endeavor. The alignment took several weeks as the radio was worked on in my spare time. Note that I did not replace any electrolytic capacitors, and yes it was the lazy man’s way but a basic inspection of the caps for any evident leaks, explosions, or burns was conducted. 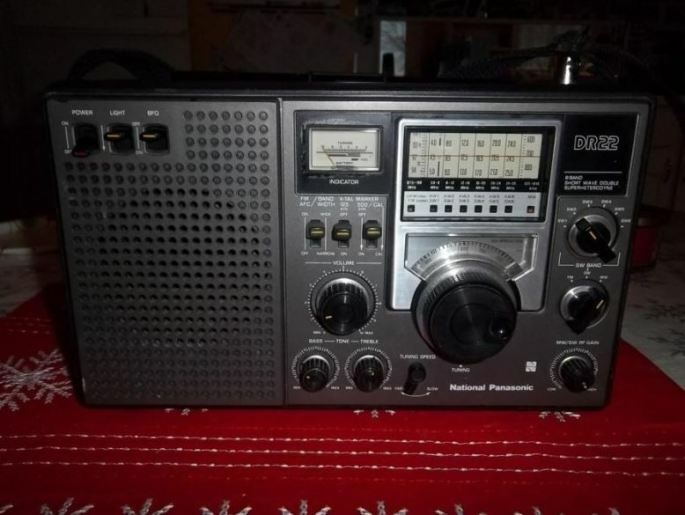 In short I did not want to replace capacitors at this time since the radio, as received from the former owner, was working well on all bands. Surely, as other operators have reported, cap replacement will restore full operational excellence but I felt if the radio passes the alignment specifications that was good enough for me at this point. After several weeks the radio was restored to specifications, all switches were cleaned and dusted and the radio reassembled. This was done a few years ago and the radio continues performing well. Even the 125/500 KHz crystal markers are pretty much on the money when checked against WWV. No scratchy pots either hi hi. So now the radio sits in my kitchen and is on at least a few hours a day and keeps company with its sister, my RF2200. Note that recently DR22s have sold on eBay for $150 – $300US. Tech specials/parts radio run considerably less. Thanks and 73’s de N2HUN.